One of Lucideon’s clients produces a bone cement that relies on a blending of polymeric and monomeric species. An inorganic radio-opacifier is also added to the blend to help visualize the location of the cement once it is placed in the body and solidified. Although the cement performed well in terms of mechanical properties, X-Ray analysis revealed variations in the distribution of the radio-opacifier. In some batches the inorganic appeared as isolated clumps rather than being homogeneously distributed. This makes interpretation of X-Ray images more difficult. Lucideon advised on a suite of analytical techniques to study each raw material component as well as the final blended mix. Techniques included SEM, particle size analysis and particle shape determination. The investigation was greatly helped by the client being able to supply all relevant materials against historical batches. This enabled a direct comparison of “good” and “bad” products. Fig 1. Image produced from SEM analysis. 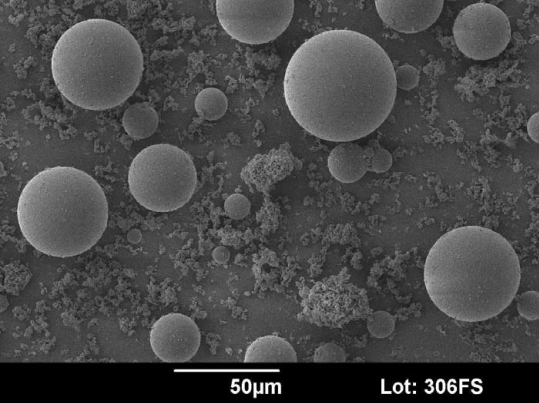 If the process used to make the polymer powder is correctly controlled, there should be virtually no larger spherical powders (there should be a much higher percentage of agglomerated material featuring lots of tiny polymer spheres clumped together). 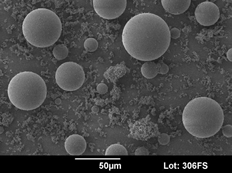 The morphology of one polymer powder changed dramatically in some batches. More specifically this affected how well the inorganic opacifier coated the polymer powder. Where coating was poor the inorganic powder tended to clump as isolated agglomerates. The client was then able to re-visit and better control the relevant in-house polymerization process to overcome the issue. Lucideon’s expertise in analytical sciences and powder processing allowed for an informed decision on the appropriate investigation to be performed, resulting in efficient identification of the cause of the issue.